Tuf Borland is Out Until September — So Now What? Last week when Urban Meyer broke the news about starting middle linebacker Tuf Borland’s Achilles tendon injury, he did so without expressing any concern that Borland’s season could be in jeopardy. In fact, he said that he had been advised that Borland would still be able to play this year. On Monday, Meyer once again met with reporters and stated that Borland tends to recover quicker than most athletes. Even still, the redshirt sophomore is expected to be out until September. That means not only will he have missed spring camp, but it looks like he will miss fall camp as well. Tuf Borland entered the spring as the leader in the linebacker room, and he’ll remain in that position off the field, but on the field, a new batch of players will have to gel and come together as a singular unit. Spring camp is used to find your starters and fall camp is used for game planning. If Borland is out until the start of the season, he’s not going to have the reps or the feel to help out right away on defense. He will have to work his way back, and possibly slowly. In his place right now at middle linebacker are fourth-year junior Justin Hilliard and sophomore Baron Browning. 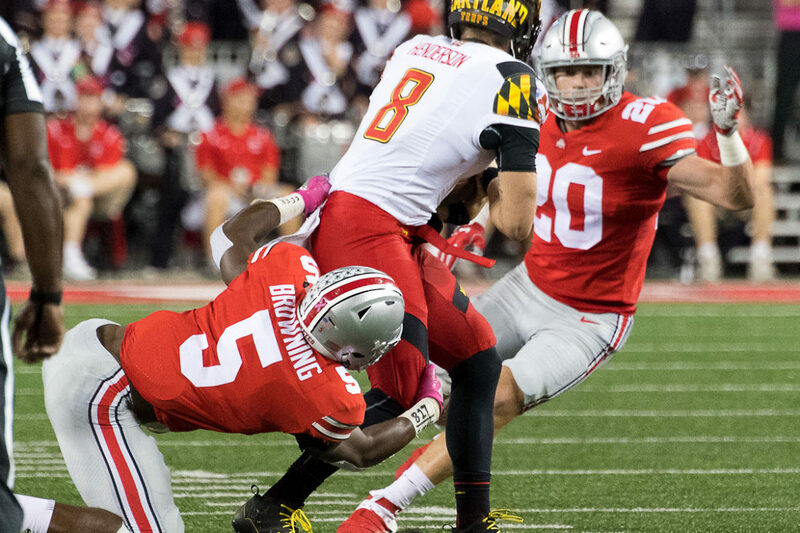 Browning graded out a champion during last weekend’s scrimmage according to Meyer, and Hilliard was close. Both are former 5-star recruits with buckets of potential, and without Borland around it looks like they are on their way to realizing that potential. That could put Borland in a very difficult situation when he returns. When Baron Browning’s name is mentioned around the Ohio State football facilities, it is never mentioned with any hint of doubt. Statements never end in a questioning manner. The coaches and players know that he is going to be a good one, and it appears that he’s going to have to be ready right now. The good news is that Browning is more well-equipped then ever before. The better news is that the Buckeyes still have options. Justin Hilliard is getting time just like Browning, and Hilliard has played well also. Despite a career weighed down by injuries, Hilliard was healthy last season and produced on special teams. He and Browning will likely battle the rest of the spring for the starting job and then into fall camp as well. Keep in mind, however, that this is a very versatile group of linebackers. At 6-foot-3 and 238 pounds with sub-4.6 speed, Browning can play any of the three linebacker spots. Justin Hilliard has played the Mike and the Will in his time at OSU. Juniors Keandre Jones and Malik Harrison are used to playing Will and Sam, respectively, but have switched positions a time or two this spring as well. Sophomore Pete Werner could play any of the three spots, and even freshman Dallas Gant is an athlete with the skill set to suit the Swiss Army. Then freshmen Teradja Mitchell and K’Vaughan Pope will get involved when they arrive in the summer. It’s no surprise that Urban Meyer said the linebackers continue to get better. They are athletic and skilled, and they’re pretty darn hungry as well. Hilliard has watched for three years. Jones has watched for two years. Harrison has played, but this is his third year and he wants a spot that is entirely his. There is so much up for grabs right now, which has me wondering how easily one of these guys will give up their job when Tuf Borland returns. Of course, as Borland showed last season, he doesn’t need anything given to him because he has no problem simply taking it. The Ohio State linebackers were up and down last season, but got better as the season wore on. This year they will have fluctuations once again because the three starting linebackers who open the season may not be the same three a month later. There are so many interesting questions to ask at linebacker, and the versatility of the group provides numerous different answers. And even if Borland does take his job back, that won’t necessarily spell the end of Baron Browning or Justin Hilliard on the field. The three best linebackers are going to play, the only question is where they will line up. Nothing will be settled this spring, but plenty will be learned. Things may begin to settle in fall camp, but linebackers are by their very nature disruptive human beings. 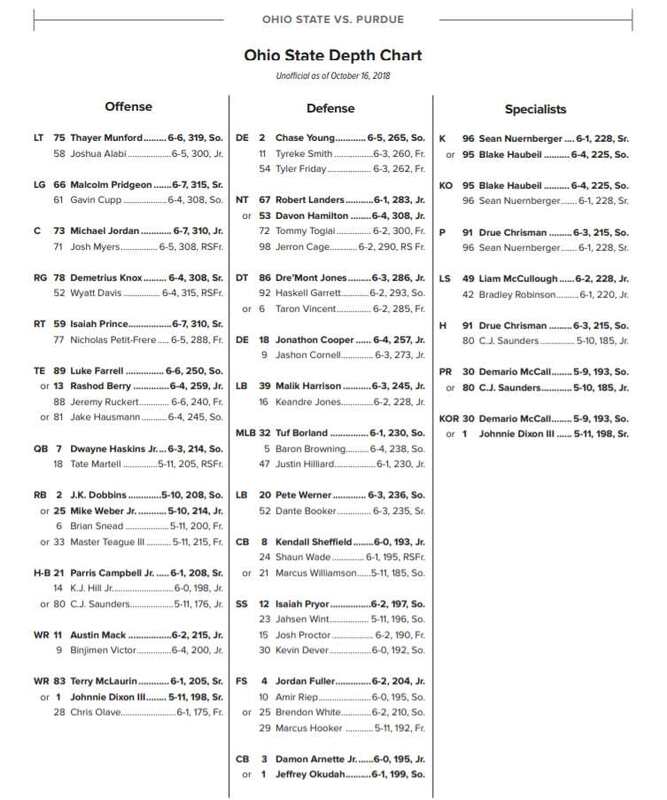 Tuf Borland may not be starting in the season opener against Oregon State, but good luck to each of the three linebackers trying to keep him from the lineup by the time October rolls around. I suspect that Tuf Borland will play in 2018. The Buckeye linebackers suddenly starting to get better in 2017 was directly the result of putting Tuf on the field. Not as highly touted as the guys behind him, but he’s a pure football player who makes an impact. But I’m not the slightest worried about it. Baron and Justin will cover for him well. It’s the 2 outside spots that are the key to linebackers productivity in 2018. If they play like they did as a unit last year we’re going to get to the backend of the season pretty miserable. Dante’ Booker has shown flashes of being really good, only to disappear from game to game, or be injured. I really expected him to be the next Josh Perry, and maybe better. That just hasn’t happened. He’s got this year to really establish himself or his career at Ohio State is seriously going to fizzle. That would be a shame because he has the tools to be great. We’ll see how things work out. Now what, is a better player will be starting at Mike.